Posted by Terrence Murphy Sr. on Friday, December 28th, 2018 at 5:33pm. 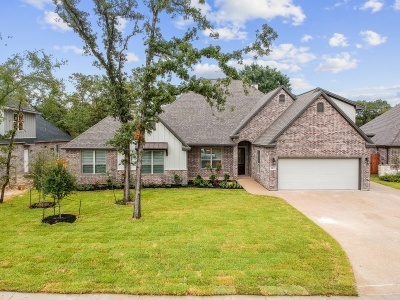 Take a look at this beautiful home in the Crossing at Lick Creek community! This two story, 5 bedroom, 3 full and 2 half bathroom home, is nestled up to the tranquil Lick Creek Park. Walk into the open living room with gorgeous exposed beam, raised ceilings, brick fireplace, and the many windows overlooking the back patio and the wooded park. Next walk into the open concept kitchen that boasts of a massive island, double ovens, ample cabinet space, and huge walk-in pantry. The covered back patio with built in sink and grill and wired for TV, creates the ideal space for entertaining. The cozy backyard features many mature trees and 3 irrigated planter boxes. The spacious master bath features a walk-in shower, tub, two sink vanity and two roomy walk-in closets. Head over to the sizable laundry room complete with sink and plenty of storage space for organization. This home features a work out room complete with outdoor bath for an on-the-go lifestyle. This home also features a bonus room that can be converted for any use. There is a large concrete pad adjacent to the house perfect for boat/RV parking. Enjoy the five miles of trails at Lick Creek Park that provide an excellent opportunity for hiking, cycling, bird watching, equestrian activities and nature study. This home is the complete package!